My parents, Cecil and Loretta Houston, and I were absolutely delighted when we received the invitation from Dr. Juan Andrade, Jr., to attend a reception at the Embassy of Mexico in DC honoring him with the Ohtli Award! Also a native of our home town Brownwood, Texas, Dr. Andrade is a close friend of the family, having attended Brownwood High School with my father and Howard Payne University with my mother. Dr. Andrade is highly regarded for his work as the Co-founder and President of the United States Hispanic Leadership Institute (USHLI), based in Chicago, Illinois. 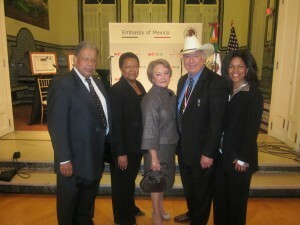 Held on May 4, during the Embassy’s Cinco de Mayo Celebration the event was a festive affair. The Ambassador of Mexico to the United States, Arturo Sarukhan, presented Dr. Andrade with the Ohtli Award on behalf of the President of Mexico Felipe Calderon. The Honorable Bill Richardson, the former Governor of New Mexico and 2008 Presidential candidate, was also honored with an Ohtli during the event. It was such a pleasure for my parents and I to celebrate this moment with Dr. Andrade and his wife Elena Andrade. Ohtli, which means “path” in Náhuatl, is the highest honor presented by the government of Mexico to a civilian living outside the country for contributions made to the empowerment of the Mexican and the Mexican-American communities in the United States. Also a Presidential Medal recipient, Dr. Andrade was previously decorated at the White House by then President of the United States Bill Clinton for his extraordinary accomplishments in promoting civic participation and leadership development. Dr. Andrade is one of only three Latinos in history to be honored by both the government of Mexico and the government of the United States! He shares this distinction with the late Cesar Chavez and the late Mario Obledo. Congratulations, Dr. Andrade, for this distinguished honor! Your life and work speaks volumes to what service truly means. Your friends, the community and TWO nations recognize, value and appreciate all of your love and labor. We are all so proud of you!! !